Check out more specific route and time details for the Waukesha Wisconsin to UIC route for Friday night at the bottom of this post. 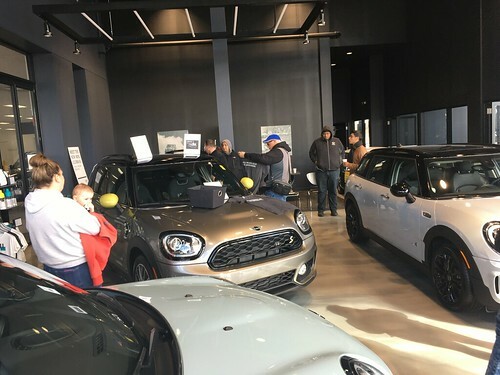 Our Club Events Coordinator Jeff is working out details for a Milwaukee/Chicago club meetup to drive in for the Friday night portion of MINI Takes the States on July 25th as well as additional information for our Drive-in event on August 16th. The next Portillos get-together in Schaumburg is on July 2nd. 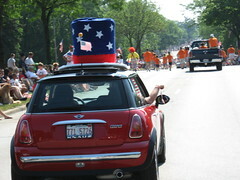 We still have about 10 or so spots open to participate in the July 4th Parade in Oak Lawn. If you are planning on attending, you need to add a comment to the post. Two words spelled out with MINIs in the parking lot to help raise the spirits of Milwaukee and Chicago club member Tom who is going through a difficult recovery following a stem cell transplant and cancer. Theresa from the MilwaukeeMINIs put out the call and 30 MINIs from as far away as Madison and Chicago came out to the hospital in Milwaukee to wish Tom well. We lined the cars up in the parking lot, with several left over around the back. When the time was right, Tom was taken for a walk to the lounge area and saw the MINIs lined up outside. Tom was very surprised and pleased at the small celebration held in the lounge. It was a great morning to be out and lend support to a club member and friend. Please forward links of pictures to steve@chicagominiclub.com and I will post them here. Some unfortunate news from the Windy City Miata Club. They are canceling the autocross events held at the College of Lake County. They will still be holding the events scheduled for Maywood. Here is a link to our last drive-in event. WRAPUP: We had a lineup of 9 MINIs participating in the parade on a beautiful July 4th morning. All the MINIs were shined up, decorated and ready to go. The parade route was packed with kids hoping for candy and toys. A fun time was had by all.